Note – if you haven’t read it already, I suggest you go back and read last week’s post describing Step 1 in the process: “Finding Stuff”. Step 2 (this post) involves organizing and screening your information. The method I’m going to describe to you was taught to me by my own PhD supervisor many years ago – I still recommend it to all of my students, though with a few modernizations included to take advantage of technologies that weren’t around when I was a student. Here’s where you ‘separate the wheat from the chaff’, as they say. You’re going to end up with a huge stack of papers – either literally or figuratively (if you’re into the paperless office, like I am). So you’re going to need a way to organize and find things. This is especially important if you don’t want to end up repeating any parts of this job. Assuming (for now) that you’re using paper copies, the first step is to make a photocopy of the first page of every paper, article and report you find. Be sure you also note the full citation on the front of the copied first page so that you can add it to your list of references easily when the time comes to prepare that. Many journal and conference papers already have this information on the front page – which is why it’s handy to use the first page in this way – but it’s not always complete – so make sure you get the full details documented right when you find the paper. Otherwise you’ll end up repeating the hunt later on – a big pain. Next, if you haven’t already done so, break your research topic into categories and each of those categories into sub-categories. Chances are you will refine this later on, especially once you get into the literature review – but do the best job you can as early as possible. Ideally you will then just have to add categories, not actually change any, later on. Give all of these categories code names (e.g. 1, 2, 3, 4, A, B, C, D, etc.) You are then going to go through all of the papers and sort them by category. To be able to categorize a paper adequately, you’re going to have to read it. So to save time overall, I suggest you make some content notes about the paper at the same time. As you go through each paper, try to identify its appropriate category (e.g. 2A, 4B etc.) as quickly as possible and write that category name on the top right corner of the copy of its front page. If an article falls into two (or more) categories, (e.g. it contains material both on category 1A and category 3B) then make one copy of the front page for each category that applies and label each separately. If you cannot think of a category for a particular reference, then it’s likely because that article is not relevant to you – at least not now. Set those references aside. Make your notes about the paper on the back side of these front page copies, being careful to write notes only on the content related to the category label on that particular page. These notes do not need to be too extensive – use keywords, point form lists and phrases to note down what aspects of the paper are relevant to the category label you have assigned. As you go through the paper itself – it helps to highlight key points and number them. Use this same numbering in your notes on the back of that front page so you can go back and find the corresponding info quickly when you come back to it later. You may want to include the category in this numbering system when annotating the actual paper in cases where more than one category applies. Once you have this done for all of your papers, organize these front pages into a binder. Use tabs to separate the different categories and make a category list at the front so you can find what you need quickly. You’ll also need to set up a filing system for the actual papers. For that, I suggest you organize them alphabetically by the last name of the first author, then by date – just as you will when you make up the list of references. For the typical PhD literature review, you are going to end up with a stack of papers a couple of feet high and a pretty thick binder of front pages. So, in the interest of saving a few dozen trees – I encourage you to do all of this electronically. Also, that way you will have all of your resource material with you no matter where you are working – that’s much more convenient than lugging around 20+ pounds of paper! There’s a lot of software out there to help you do this and it can be challenging to know what is best to use. Some people just use a combination of a spreadsheet program and a word processor, others might prefer to use annotated PDF files. 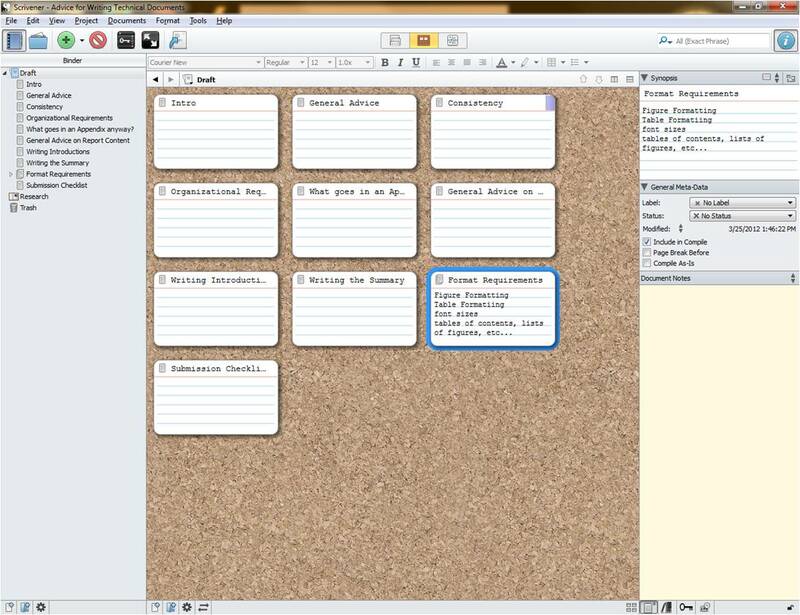 I like the idea of having everything in one place and one way to achieve that is to use Scrivener. It’s a software program used by a lot of writers – especially those working on big projects like novels or textbooks. Scrivener lets you create these summaries and you can even embed PDF files of the papers right alongside. You can also look at things in a variety of ways – for example, as index cards or in documents. In fact – you can even write you thesis in there too if you like – and later export it to a variety of common word processor programs. Scrivener is relatively inexpensive (~$40) and easy to get started with (you can even try it for free for 30 days) – though I’m sure it could take years to learn everything it has to offer – it’s just that powerful. 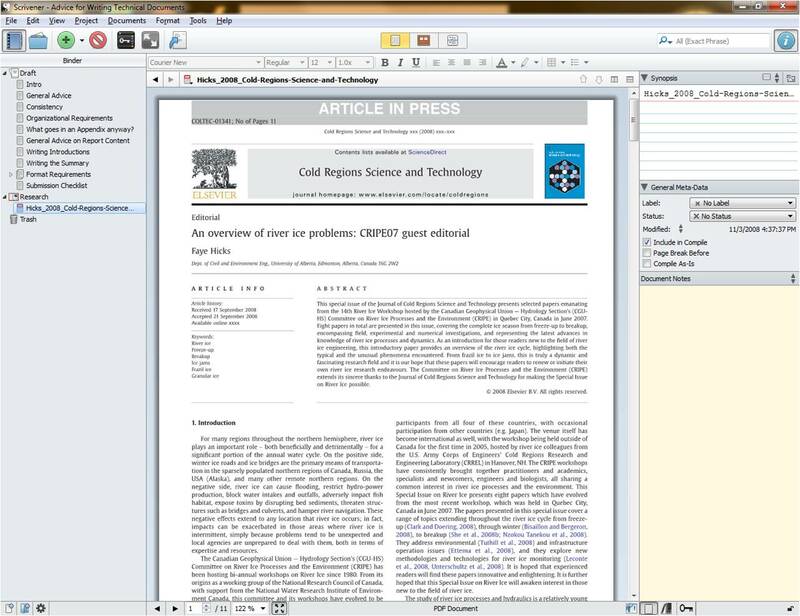 Many universities also have low cost (site licensed) software for organizing literature (e.g. EndNote). However you choose to do it – organizing and screening your literature is a huge job. Also, chances are that you will have to read at least some of these papers many times before you get everything you need from them (mainly because it can take a while to absorb everything fully). Having things categorized and indexed can save you a lot of paper shuffling (and time!) in the long run. Believe it or not, even after all of this work, you’re not going to be ready to start writing the literature review quite yet. You first need to “normalize” the information. That will be the subject of my next post. This is an awesome blog. I just discovered it. Great job, and thank you so much for taking the time and trouble to share your knowledge with the rest of us. I am planning to write a master’s thesis next year and will definitely return to this site.